i really like pinks. i'm guilty. it's lame i know, haha. but i do! corals are really my guilty pleasure but pinks are pretty close. this pink is so cute and i found it in a discount bin in trade secret so i snatched it up of course of course. 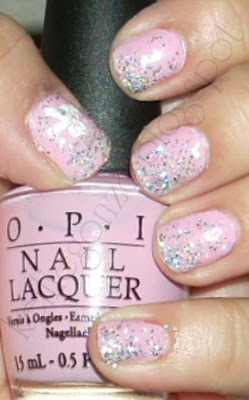 a pretty lavender tinted pastelish pink creme from opi, i'm ok, you're bouquet suggests this pink to be perfect for weddings. which i dare to say it would be. i put some old GAP brand silver chunky glitter i had in the corners, attempting to do a cascading look. and on the thumb i used white acrylic paint to do a simple bow, using the same sort of technique i mentioned in the gussied up green post, i've just added ribbon to the end and flattened it out a bit. i thought i did ok with it actually, but trying to do it on my right hand was a different story haha and a definite fail though, so i need to keep practicing! i hope everyone had a great weekend! i had an amazing time shopping with the sister, so you'll be seeing some haul photos soon! !